We respond to color by associating it with the things we have the strongest feelings about. For some, white evokes first a wedding dress, for others snow, for others whipped cream, for some white skin! But for every thinking being, name a color, and we can quickly identify many things we associate with those colors. Every one of those colors carries with it a feeling. Our eyes react, our body reacts, and our mind reacts. We “feel” jazzed, calmed, warned, afraid, joyful, disgusted. The wide range of human emotion is inextricably tied to color. Successful garden design plays upon these associations. A garden color scheme that is both colorful and able to deliver strong visual impact is realized by playing with these nuances of meaning and evoking emotional responses. Color, scientifically, is a function of light. Light reflected from the sun reaches our eyes as a specific color depending upon what objects it touches and how it is absorbed by the object. But light from the sun cannot be “seen”, since it is colorless. Color is an effect of light refraction, absorption and reflection. As a result of this process, our brains receive messages that we interpret through our individual set of experiences as color. Through our learned associations, we attach meaning to those colors. Those associations are built upon our experiences, culture, and preferences. 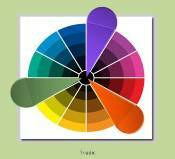 As early as 1708, the concept of a color circle, or color wheel, was introduced. focusing on the perception of color by the human eye. 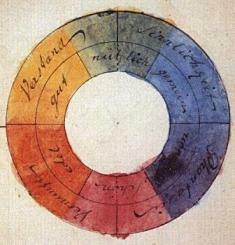 This was among the first precedents for the modern day color wheel. 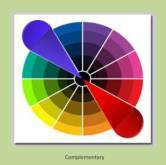 This useful tool has resulted in a series of terms which are used in all art and design circles to describe color and color schemes. The short video below is an out of the ordinary representation of the color wheel and the many terms that have been identified to describe most of the various color schemes we will be reviewing on this page. Now that you have a basic understanding of the important terms from color theory that describe combinations of color, we’ll examine them in the context of color schemes. Because of our learned associations with color, the psychological effect of some colors brings us a sense of warmth. 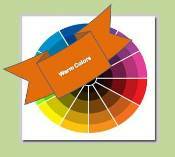 These colors are called warm colors, or active colors. Associations with these colors tend to be such things as sunlight (yellow) and fire (orange and red). On the other end of the spectrum are the cool, or passive colors. These colors are associated with the cooler, quieter human experiences. Blue is naturally associated with the water and the sky, greens are associated with grass and water. These natural elements have a cooling effect upon us, and similarly, these cooler colors have a more passive effect upon our psychology. When translating this knowledge into the garden, the designer must determine what final effect is being created. Note below the contrasting effect of these two garden spaces. The garden using warm colors is eye catching. It grabs your attention. What do you think of when you see the oranges, yellows, reds in this garden? Do you want to sit down and rest, or walk around and see everything more closely? The picture on the right uses cool colors. Greens, deep purples, soft blues. These colors all come from the cool side of the color wheel. Notice the effect that this photo has on your emotions. You probably want to find a bench, sit down and drink in the view. Understanding this use of color schemes is important in ensuring a garden functions in the manner intended. This is probably most apparent in designing something like a patio. Color choices can make it easy to sit out on the patio reading a book and lazing away the afternoon, or can boost the effectiveness of a patio often used for entertaining purposes. The warmer colors tend to boost the urge to move! These hotter color schemes can be placed near doorways, in front spaces designed to grab the attention of the drivers passing by, or to create a distant focal point in an area of the garden that would otherwise fade into oblivion. The cooler colors, by contrast, are the best choices when the intended use of the area is to relax in. Areas intended to read, allow you to have a quiet dinner outside, or to become a long term outdoor living space most likely will benefit from the liberal use of cooler colors. These colors are also extremely useful in creating quiet focal points such as a garden grotto, or in helping to create a sense of distance in a small garden. Some colors such as white, black, grey, silver, and brown are generally considered neutral in the garden. Design tricks can make these colors very dominant, but without the considered effort of the designer, these colors will generally become transition colors, or less visually important. 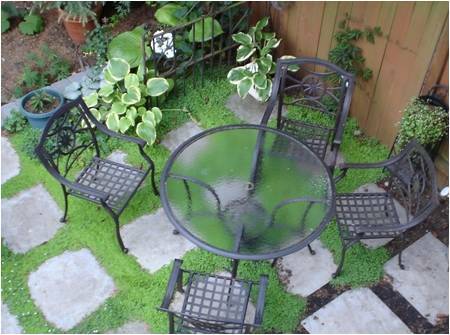 Green can also be considered a neutral in the garden, depending again upon its use. With skillful use of other colors and a keen eye to balance, green can become very active in the overall color scheme chosen, however generally, green becomes a part of the transitional or background color in most garden color schemes. Using the color wheel, we’ll now discuss some of the exciting and interesting effects you can create using strong color schemes. It is important here though, to state that you do not need to sit down and use a color wheel every time you want to make a choice of garden color schemes. Recognizing how color works is a great tool to use as a designer, and the color wheel is a strong way to discuss this phenomenon..
Now to touch base on some exciting garden color schemes! Some of the most stimulating color schemes are those that are built upon the use of complementary color schemes. 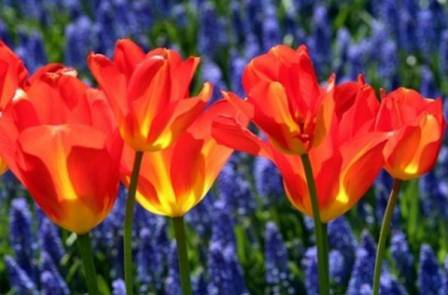 As you can see in the color wheel, the two colors in the garden photo here of tulips and grape hyacinth are polar opposites. This has a dramatic effect upon our visual stimulation. Typical complementary color combinations are orange and blue as in the photo above, red and green, yellow and purple, and green and hot pink. We gasp, and grow excited easily when viewing a garden clearly built upon complementary colors. With skillful use, these are the gardens that we point at from a distance and nudge our neighbor to make sure they don’t miss them. Split Complimentary garden color schemes tend to give a twist to a garden. 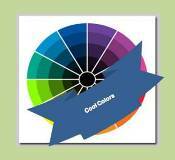 They use one color on the color wheel directly across from two colors that are similar, as seen in this color wheel. This particular color scheme uses a deep purple and a deep burgundy color across from a dramatically different chartreuse yellow green color. As you can see, the effect, while beautiful, can be a bit jarring. However, this color scheme works, and leaves the viewer with a feeling of energy, in spite of the liberal use of the cooler colors. 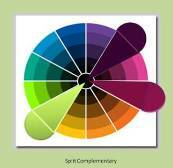 All of these garden color schemes form a narrow y shape on the color wheel. Analyze what the effect of each of these might be when comparing on the color wheel. Identify the deep blues, across from bright oranges and yellows; deep purple across from orange and green; deep pink across from turquoise and yellows. You can see that all of these combinations are going to create a real sense of energy and vigor. and the deep purple by the morning glory vines. This is an exciting combination, which is at the same time is well grounded. Note the difference in your viewing experience between this garden color scheme and the complementary color scheme above. This garden photo has the calming dusty green color which lends a sense of restfulness to the garden color scheme. It is still vibrant, exciting and visually stimulating, but it is not quite as aggressive as the complementary garden color schemes above. wheel. These gardens can be very dramatic, as is the garden pictured above. 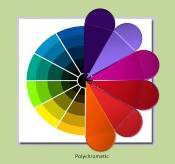 The adjacent colors can be used to lead the eye and create movement in a garden color scheme. These garden color schemes also are quite unified by definition. 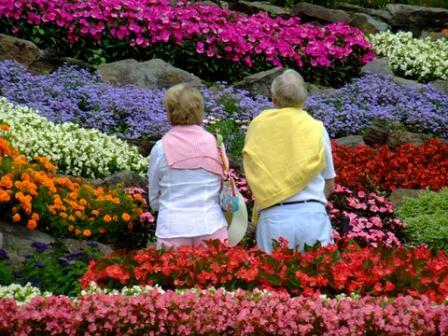 There is little chance of a significant misstep when using analogous garden color schemes. 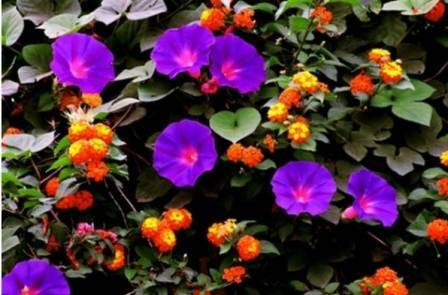 These garden color schemes can be drawn from anywhere on the color wheel, and can create a very warm effect, as above, or a very cool effect, as when the blue and purple ranges of color are combined. Monochromatic garden color schemes can be truly exceptional. 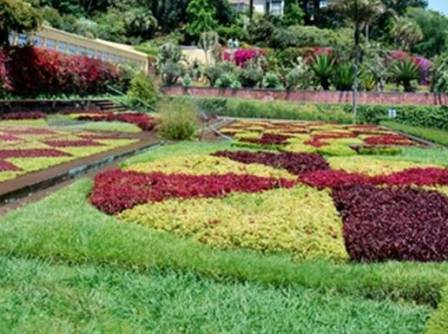 These gardens use the range of color hues from only one spoke on the color wheel. The garden above is a shade garden, and uses green almost exclusively to create a very cool, welcoming effect. These gardens can use any range of hues from any spoke of the wheel. The effect of each garden will be dramatically different from the effect of using another spoke of the wheel. The almost exclusive use of green above creates a very relaxing, passive, pleasant effect, while using only the colors in the orange spoke of the wheel will create a very dynamic, stimulating outcome that would very likely be difficult to sit down within for too long a time! However the same orange spoke of the wheel applied to a garden that was in a distant corner of the backyard would create a truly dramatic focal point! 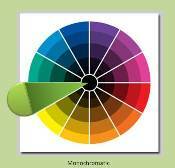 Polychromatic color schemes use many colors from the color spectrum. This particular garden uses the full range of warm to cool colors in its application. The range could extend clear around the entire color wheel in some gardens. While this is the most “natural” garden to create, because we have so many colors to choose from, and we get so excited about all the nuances of color available on the market, this garden color scheme is, of the above, the most difficult to pull off. 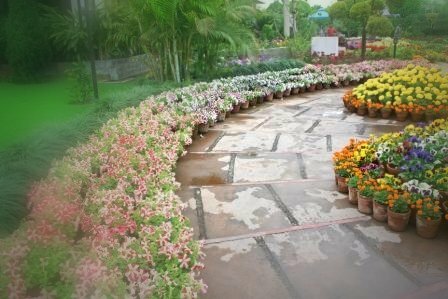 A polychromatic garden that is not fairly carefully planned can create a very jarring, jumbled effect. Note in the garden pictured above, the plants have been used in carefully balanced drifts of color that are softened here and there with neutral colors. The effect is quite pleasing. 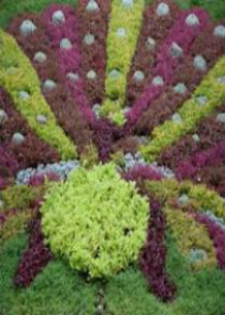 Gardens that use polychromatic effects will generally not rely on color alone to create drama or interest. They require the careful use of such ideas as repetition, movement, line, or space to create a pleasing effect. 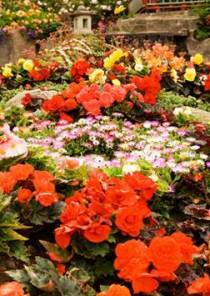 A garden that is just a jumble of color can appear disordered, sometimes even displeasing, to a visitors eye. With all the discussion above regarding garden color schemes, I would like to remind you that nature itself, without our intervention, is a masterful colorist. Sometimes, in the right places, it is just best to leave Mother Nature alone. Always include nature as the primary influence on your garden color schemes. Gardens that borrow from what is already present are always much more enduring and effective. Enjoy this video as a colorful, peaceful reminder of the overwhelming beauty to be found in nature.